At the time, it seemed like a pretty good idea. Drive on down to Pagosa Springs, CO, via a leisurely timetable and route, stopping to see our friend Regina in Montrose and spending a couple of days with Tim and Diane in their Colorado home before heading out to enjoy the golden aspen and clear blue skies of early fall in the backcountry of SW Colorado. Indeed, it was a manifestly beautiful day as we crossed Red Mountain Pass, headed south to Durango and then east to Pagosa Springs. This morning, we were up and out the door by 7:30, driving two vehicles. While it might seem like a waste, this would be an open-ended loop trip, with about 6 miles between the ends of loop, and no one, myself included, was very enthusiastic about hiking an additional 6 miles at the end of our last day, planned to be at least 10 miles. It was a good thing we left early, because while the trailhead for the hike, Ute Creek, is only 39 miles as the crow flies from Tim and Diane's home, it is well over 100 miles by car, including a crossing of the Continental Divide at Wolf Creek Pass. With major construction underway on the Atlantic side of the pass, it would be 10:30 before we could drop off T&D's car, and shuttle all four of us and packs to the trailhead at the far eastern end of Rio Grande Reservoir. Our plan was to hike up the West fork of Ute Creek to some high meadows about 1.5 miles NE of West Ute Lake for the day. 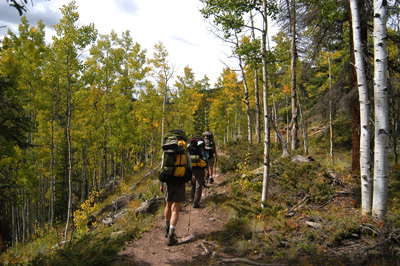 Day 2 would be a relatively easy hike along the Divide Trail to the vicinity of Twin Lakes. Day 3 would be more CDT, camping our last night near a small pond underneath The Window, an obvious and well-known landmark on the CDT. Our final day would entail dropping out of the high country at Weminuche Pass, a huge, three mile long meadow that straddles the Divide, heading down to Thirty Mile Campground, which sits just east of the dam holding the reservoir. At least that was the plan. But of course, plans have a way of being modified in route. The beginning of the Ute Creek trail is a bit frustrating. 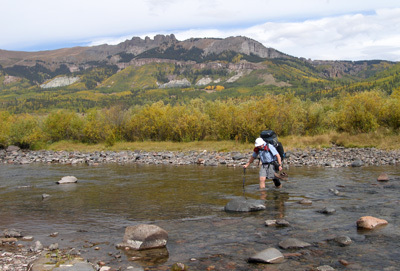 You hike all of maybe all of a hundred meters, and then doff your boots to do a wet foot ford of the river. I would imagine in spring time that the water is fairly high. Late in the season, the crossing was more of an ankle deep nuisance than an impediment to travel. By the time we had crossed, dried out feet and re-donned our hiking boots, it was 11:10 am. Pretty late start for a big day. But with the crossing behind us, we were determined to make up some time, and put the hammer down to climb up through golden aspens. While the day was not blue sky, it was nice enough. At least the ceiling was high, and the threat of rain low. The trail, Ute Creek, climbs gradually but steadily along the right side of the creek. We were in the trees for a bit, but eventually, the trail breaks out in the open and gives great views of the valley as it ascends toward the high country. After an hour or so, Tim was starting to talk about the possibility of spending the night at Black Lake, instead of the higher meadows. At first, I thought to myself: boy, we ought to be able to do better than that. After all, T&D are TIM and DIANE, noted for their amazing hiking ability. And Susie and I had been doing fairly long "first days" recently (eg, 9 - 10 miles, with 2500 feet of elevation gain). But we had been starting earlier in the day, and today, we had started at an elevation where many of our backpacks had been climbing to lately. Welcome to Colorado. Besides, Tim confessed that a) they had not been backpacking since our last trip together and b) he could tell he was developing blisters on one of his feet. As we sat down to have a late lunch at the edge of a lovely meadow about 3.5 miles up the trail, I started "doing the math." Based on our rate of hiking ("glacial" is probably an overstatement, but we were not exactly sprinting up the trail), it would be pushing 5:30 - 6 pm before we made it to the target meadows near where the CDT joins the West Ute Creek trail. Given the fact that we had a short-cut alternative available, the Middle Ute Creek trail, and a strong desire to have this be a fun trip where we could enjoy the scenery without people hurting (including myself, of course), the concept of spending the night near Black Lake was sounding better and better. After lunch, the grade of the trail steepened considerably. Nothing horrible, but at probably twice as steep as the pre-meadow section. 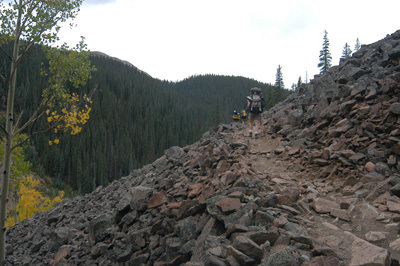 I could tell, as we crossed an open talus slope, the crew was really starting to slow. Our decision to terminate the day's adventures seemed an increasingly enlightened one. After we passed through a set of switchbacks, I could feel we were getting close, and sure enough, here was a nice, open camping area to the left of the trail, immediately downstream of the lake. We arrived at camp at 3:30, indicating about 4.5 hours of real hiking today. Now, while the guidebooks say that there is good camping near Black Lake, what they don't say is that getting close to the lake to get water or bathe is a bit of a chore. Black Lake is perched on a shelf, perhaps 400 feet above the valley up which we had just come. The lower end of the Lake is quite boggy, and it was a pain to try to stand on hummocks among the trees and try to balance while getting water or attending to other personal hygiene chores. It might be easier to go around the trail a bit past the obvious camping spot, and get water there. However, such is still a bit of a thrash through riparian vegetation. 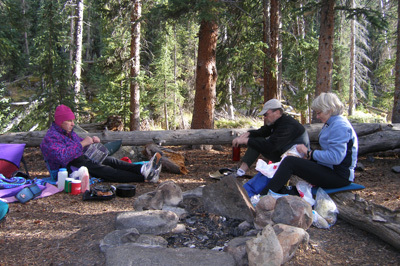 The campsite itself is at 13S, 287436 E,4175789 N (Note, all GPS coordinates in this write up are in the NAD27 grid.). We got a brief break with some sun, but it clouded up again. Dinner was started a bit after 5 pm. I think everyone was pretty tired. Dinner for us was Hamburger Helper Beef Stroganoff, with dehydrator dried ground beef and mushrooms. As always, a good filling meal. T&D augmented their repast with a small glass of wine shared among the two of them. I guess I either need to have more, or none at all. But it was nice to see them smiling, especially with Tim's blisters. After dinner, we built a small trash fire (plenty of wood around) and chatted for a bit. Bedtime was when the stars came out. This was our first night in our new Sierra Designs Hyperlight AST 3. We have used a Hyperlight 2 for a couple of years, with Susie complaining about a) the lack of room (the first advertizement for the two person version of the tent rated it at over 40 sq feet of floor space. Simply put: no way in the world.) And b) the inability for two of us to sleep in symmetrical fashion. The only way we could fit in the two person version was for Susie to sleep with her head closer to the apex of the tent floor than my head by about a foot. The Hyperlight 3 has solved these problems: better ventilation, two doors instead of one, more room and the ability to sleep in a symmetrical fashion. All for about 20 more oz of real pack weight. I think we had found out tent. A good thing, because it was not too long before the sprinkles started.